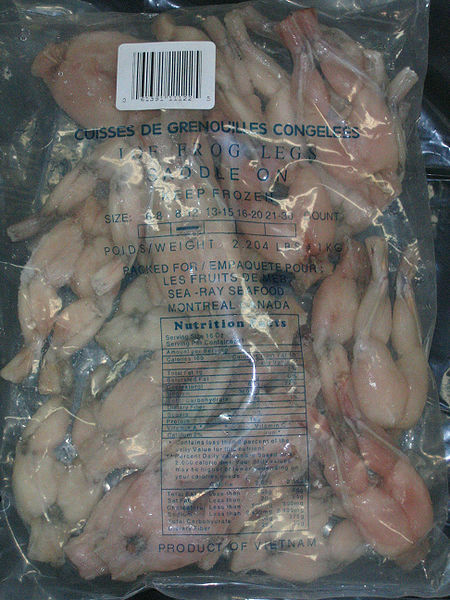 Frogs' legs are one of the better-known delicacies of French and Cantonese cuisine. They are also eaten in other regions, such as the Caribbean, the region of Alentejo, in Portugal, northwest Greece, Piemonte in Italy, Spain and the Midwest southern regions of the United States. Left: Frog legs French style. A type of frog called the edible frog is most often used for this dish. They are often said to taste like chicken because of their mild flavor, with a texture most similar to chicken wings. This dish is in the English-speaking world traditionally associated with French cuisine, and a favourite pejorative English nickname for the French is the Frogs. 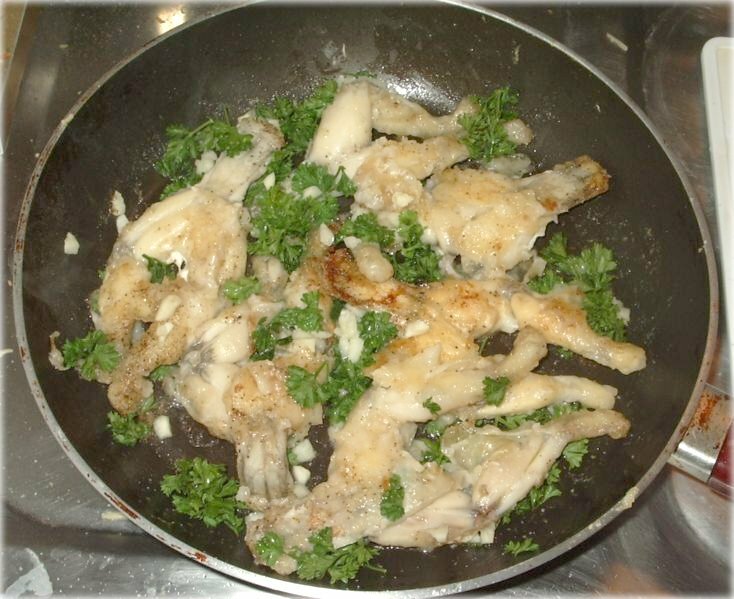 The frog legs are particularly traditional in the region of the Dombes (département of Ain) and in the region of Lyon, where they are traditionally prepared with butter, garlic and parsley sauce and often served only with a salad or steamed rice. The dish is common as well in French speaking parts of Louisiana, particularly the Cajun areas of Southern Louisiana as well as New Orleans. Only the upper joint of the hind leg is served, which has a single bone similar to the upper joint of a chicken or turkey wing. They are commonly prepared by frying or deep-frying, sometimes breaded and sometimes unbreaded. Frogs are raised commercially in certain countries, e.g. Vietnam. Frog muscle does not resolve rigor mortis as quickly as warm-blooded muscle (chicken, for example), so heat from cooking can cause fresh frog legs to twitch. Left: A bag of frog legs from Vietnam.